Master Coalescer Jr packs the punch to add up to BIG savings. 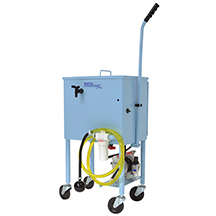 A low-cost, smaller yet effective, tramp oil separator: Master Coalescer Jr.™ Compact and affordable, Master Coalescer Jr processes machine tool coolants to remove tramp oils and fines and provide clean, reusable coolant – paying for itself with extended coolant and tool life, improved machinability, and reduced maintenance. Electric 120 volt diaphragm pump – primes to 48"